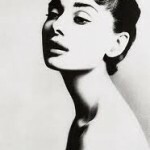 I know that I used to have one, although it certainly was no rival to Audrey Hepburn’s. But I do remember, as a 50s teenager, knotting a small scarf around my neck, western-style, as was the fashion in those days. The fashion these days is those long, wide scarves, wrapped twice around the neck. I love the look, but you need a neck to make it work. On me, that kind of scarf covers me from clavicle to mouth. Maybe OK for chill winter weather, but as a fashion statement? Uh uh. And whatever happened to my chin? Where did all that extra skin come from? Getting old is neither for sissies nor the vain. This entry was posted in aging, bitching, culture, loss, nostalgia, vanity by Elaine. Bookmark the permalink. I have a short neck, too, so I wear them loosely knotted like a sailor’s tie. It works for me!! !